This year the celebration of World Mission Day has a very special meaning. The 50th anniversary of the beginning of the Second Vatican Council and of the opening of the Year of Faith and of the Synod of Bishops on the theme of the New Evangelization contribute to reaffirming the Church's desire to engage with greater courage and zeal in the missio ad gentes so that the Gospel may reach the very ends of the earth. The Second Vatican Council, with the participation of Catholic Bishops from all the corners of the earth, was a truly luminous sign of the Church’s universality, welcoming for the first time such a large number of Council Fathers from Asia, Africa, Latin America and Oceania. Scattered among non-Christian peoples, missionary Bishops and indigenous Bishops, pastors from communities brought to the Council the image of a Church present on all the continents and interpreted the complex realities of what was then called the “Third World”. Enriched by their experience of being pastors of Churches, young and in the process of formation, motivated by passion for spreading the Kingdom of God, they contributed significantly to reaffirming the need and urgency of the evangelization ad gentes, and hence to placing the Church's missionary nature at the centre of ecclesiology. Today this vision is still valid, indeed, it has experienced a fruitful theological and pastoral reflection and, at the same time, is presented with new urgency because the number of those who do not know Christ has grown: “The number of those awaiting Christ is still immense”, said Bl. John Paul II in his Encyclical Redemptoris Missio on the permanent validity of the missionary mandate and he added: “we cannot be content when we consider the millions of our brothers and sisters, who like us have been redeemed by the blood of Christ but who live in ignorance of the love of God” (n. 86). In announcing the Year of Faith, I too wrote that “today as in the past, he (Christ) sends us through the highways of the world to proclaim his Gospel to all the peoples of the earth” (Apostolic Letter Porta Fidei, n. 7). Such proclamation, as the Servant of God Paul VI said in his Apostolic Exhortation Evangelii Nuntiandi, “is not an optional contribution for the Church. It is the duty incumbent on her by the command of the Lord Jesus, so that people can believe and be saved. This message is indeed necessary. It is unique. It cannot be replaced” (n. 5). We therefore need to recover the same apostolic zeal as that of the early Christian communities, which, though small and defenceless, were able, through their proclamation and witness, to spread the Gospel throughout the then known world. No wonder, therefore, that the Second Vatican Council and the subsequent Magisterium of the Church insist in a very special way on the missionary mandate, which Christ entrusted to his disciples and which must be a commitment of all the People of God, Bishops, priests, deacons, men and women religious and lay people. The duty of proclaiming the Gospel in every corner of the world is primarily incumbent on the Bishops, directly responsible for evangelization in the world, both as members of the Episcopal College and as Pastors of the particular Churches. In fact, they “have been consecrated not only for a particular diocese but for the salvation of the entire world” (John Paul II, Encyclical Letter Redemptoris Missio, n. 63), “preachers of the faith, who bring new disciples to Christ” (cf. Ad Gentes, n. 20) and make “visible the missionary spirit and zeal of the People of God, so that the whole diocese becomes missionary” (ibid., n. 38). The mandate to preach the Gospel, therefore, for a pastor does not end with his attention to the portion of the People of God entrusted to his pastoral care or in sending out priests or lay people fidei donum. It must involve all the activities of the particular Church, all her sectors, in short, her whole being and all her work. The Second Vatican Council clearly pointed this out and the subsequent Magisterium reaffirmed it forcefully. This requires the regular adjustment of lifestyles, pastoral planning and diocesan organization to this fundamental dimension of being Church, especially in our continuously changing world. And this also applies for the Institutes of Consecrated Life and the Societies of Apostolic Life, as well as for Ecclesial Movements: all the components of the large mosaic of the Church must feel strongly called into question by the mandate of the Lord to preach the Gospel, so that Christ may be proclaimed everywhere. We pastors, men and women religious and all the faithful in Christ, should follow in the footsteps of the Apostle Paul, who, as “a prisoner for Christ Jesus on behalf of you Gentiles” (Eph 3:1), worked, suffered and struggled to bring the Gospel among the Gentiles (cf. Col 1:24-29), sparing no energy, time or means to make the Message of Christ known. Today too the mission ad gentes must be the constant horizon and paradigm of every ecclesial endeavour, because the identity of the Church herself is constituted by faith in the Mystery of God who revealed himself in Christ to bring us salvation, and by the mission of witnessing and proclaiming him to the world until he comes. Like St Paul, we should be attentive to those who are distant, to those who do not yet know Christ or who have not yet experienced the fatherhood of God, in the awareness that missionary “cooperation includes new forms — not only economic assistance, but also direct participation” to evangelization (John Paul II, Encyclical Letter Redemptoris Missio, n. 82). The celebration of the Year of Faith and of the Synod of Bishops on the New Evangelization will be favourable opportunities to relaunch missionary cooperation, especially in this second dimension. The eagerness to proclaim Christ also urges us to read history so as to perceive the problems, aspirations and hopes of humanity which Christ must heal, purify and fill with his presence. His Message is ever timely, it falls into the very heart of history and can respond to the deepest restlessness of every human being. For this reason all the members of the Church must be aware that “the immense horizons of the Church's mission and the complexity of today’s situation call for new ways of effectively communicating the Word of God” (Benedict XVI, Post-Synodal Apostolic Exhortation Verbum Domini, n. 97). This demands, first of all, a renewed adherence of personal and community faith in the Gospel of Jesus Christ, “especially at a time of profound change such as humanity is currently experiencing” (Apostolic Letter Porta Fidei, n. 8). In fact, one of the obstacles to the impetus of evangelization is the crisis of faith, not only in the Western world, but among most of humanity, which, however, is hungering and thirsting for God and must be invited and brought to the bread of life and the living water, like the Samaritan woman who goes to Jacob’s well and converses with Christ. As John the Evangelist recounts, this woman’s story is particularly significant (cf. Jn 4:1-30): she meets Christ, who asks her for a drink but then speaks to her of a new water which can satisfy thirst for ever. At first the woman does not understand, she remains at a material level, but slowly she is led by the Lord to make a journey of faith which leads her to recognize him as the Messiah. And St Augustine says about this: “after having welcomed Christ the Lord in her heart, what else could [this woman] have done other than leave her pitcher and run to the village to announce the good news?” (cf. Homily 15, 30). The encounter with Christ as a living Person, who satisfies the thirst of the heart, cannot but lead to the desire to share with others the joy of this presence and to make him known, so that all may experience this joy. It is necessary to renew the enthusiasm of communicating the faith to promote a new evangelization of the communities and Countries with a long-standing Christian tradition which are losing their reference to God so that they may rediscover the joy of believing. The concern to evangelize must never remain on the margins of ecclesial activity and of the personal life of Christians. Rather, it must strongly characterize it, in the awareness that they are those for whom the Gospel is intended and, at the same time, missionaries of the Gospel. The core of the proclamation always remains the same: the Kerygma of Christ who died and rose for the world’s salvation, the Kerygma of God's absolute and total love for every man and every woman, which culminated in his sending the eternal and Only-Begotten Son, the Lord Jesus, who did not scorn to take on the poverty of our human nature, loving it and redeeming it from sin and death through the offering of himself on the Cross. Faith in God, in this project of love brought about in Christ, is first and foremost a gift and a mystery which must be welcomed in the heart and in life, and for which we must always thank the Lord. However, faith is a gift that is given to us to be shared; it is a talent received so that it may bear fruit; it is a light that must never be hidden, but must illuminate the whole house. It is the most important gift which has been made to us in our lives and which we cannot keep to ourselves. “Woe to me if I do not preach the Gospel!”, said the Apostle Paul (1 Cor 9:16). This word has a strong resonance for every Christian and for every Christian community on all the continents. Mission awareness has also become a connatural dimension for the Churches in mission lands, the majority of which are young, even though they themselves are still in need of missionaries. Many priests, men and women religious from every part of the world, numerous lay people and even entire families leave their countries and their local communities and go to other Churches to bear witness to and to proclaim the Name of Christ, in which humanity finds salvation. It is an expression of profound communion, sharing and charity among the Churches, so that every man and woman may hear or listen again to the saving proclamation and approach the sacraments, source of true life. Together with this lofty sign of faith that is transformed into love, I remember and thank the Pontifical Mission Societies, instruments for cooperation in the universal mission of the Church across the world. Through their action, the proclamation of the Gospel also becomes an intervention on behalf of one’s neighbour, justice for the poorest, the possibility of education in the most remote villages, medical aid in isolated places, emancipation from poverty, the rehabilitation of the marginalized, support for the development of peoples, overcoming ethnic divisions, and respect for life in all its stages. Dear brothers and sisters, I invoke on the mission of evangelization ad gentes and, in particular, on its workers, an outpouring of the Holy Spirit, so that God’s grace may enable it to advance firmly in the history of the world. Together with Bl. John Henry Newman I would like to pray: O Lord, accompany your missionaries in the lands to be evangelized, put the right words on their lips and make their labours fruitful". May the Virgin Mary, Mother of the Church and Star of Evangelization, accompany all Gospel missionaries. The funeral Mass at St. John's Church, Sealdah at 3:00 p.m. on Saturday, 22nd September 2012, followed by interment at St. John's cemetery. Fr. Joseph D’Silva was born at Bondel, Mangalore, on 5th April 1952 as the second of the three children and only son to the late Mr. Alphonse Cajetan D’Silva and Mrs. Nathalia D’Souza. He has an elder sister (Christina) and a younger sister (Mary Josephine). From 1972-74, Br.Joseph studied Philosophy at Morning Star College, Barrackpore. In 1974, he did his regency at St. Teresa’s Church, and St. Peter’s School, Moulali. From June 1975 to April 1979, he studied Theology at Morning Star College, Barrackpore. On 11th May 1979, Fr. Joseph was ordained a priest by the late Bishop Basil S D’Souza of Managlore. At Vianney Home, Middleton Row, Kolkata: December 2011 until he breathed his last on 19th Sept. 2012. That was the availability of Fr. Joe for God’s work with generosity and faith, carrying the Cross daily. In a note dated 26.2.2010 and signed by him, he considered his entire Priestly ministry as a Way of the Cross with 14 stations, a way that leads to death and through death, to resurrection and salvation. Fr. Joseph had a miraculous cure of a pancreas-related ailment about 9 years ago, and the last 10 months he spent at Vianney Home fighting a brave battle with diabetes and heart problem and finally surrendered his life to the Lord peacefully at 9.15 p.m. on Wednesday, 19th Sept. 2012 as Archbishop Henry D’Souza administered to him the Sacrament of the Sick. It was indeed a happy death. As in life so in death, Fr. Joseph lived his simplicity to the end. In the death of Fr. Joseph D’Silva, the Archdiocese of Calcutta has lost a generous and dedicated pastor. The family has lost a dear one, and all of us a cheerful friend. We are grateful to the parents and family members of Fr. Joe who offered him to the service the Lord in this Archdiocese. Today we remember in a very special way his dear mother, now 87 years of age, and sick, who, like Mary the mother of Jesus is grieving the loss of her only son. Fr. Joseph’s younger sister Mary, his niece Jane, and nephew Rohan will represent the family at the funeral. May the Lord grant Fr. Joe eternal rest and life. 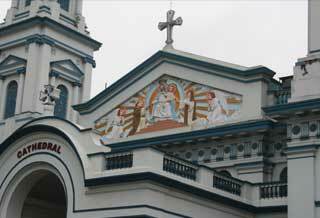 This year the Chrism Mass will be held at the Cathedral of the Holy Rosary, 15 Portuguese Church Street, Kolkata 700001. All priests in the archdiocese as well as the laity are invited to join Archbishop Thomas D’Souza in the Eucharistic celebration held at 6.00 p.m. on Thursday, 29th March 2012 during which the Holy Oils will be blessed and consecrated.